A desperate father has been banned from seeing his young son for four years after he was found with an unloaded gun he legally owned in the back of his car among his possessions as he moved house. 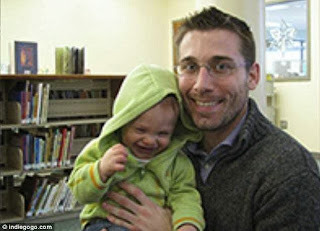 Brian Aitken was arrested in 2009 as he was moving back from Colorado to New Jersey to be near his child after a divorce. He was later convicted of possessing a gun and sentenced to seven years' prison. Now the New York University graduate and digital media entrepreneur is using a crowdfunding website to raise funds so he can write a book about his ordeal and hopefully be reunited with his little boy. I do not understand his crime. I thought that it was legal to have a gun in New Jersey. But why should this have anything to do with seeing his son? Many dads have guns, and maybe even most dads. More importantly, he is still unable to see his son, who is now five years old, because he cannot meet the harsh restrictions the judge placed on him. He now travels around the U.S. raising awareness about what happened to him and the huge ramifications it has had on his life. His story has also been covered in print, online and TV media. In his latest push, he is raising funds on crowdfunding website Indiegogo to write a book about his experience and to be able to take his case to the Supreme Court. I hate to say it, but he will not get his case to the Supreme Court, and he probably won't even get his book published. His story is a little different, but millions of dads have suffered injustices. This isnt a dad issue so much as its a police state issue. Police have become militarized and have huge power to bring cases like this. Ive read about this case a bit. Its classic "overbooking" and bullying by the police to scare a citizen. In this case the charges stuck. But even if it hadnt, think about the damage. Thousands of dollars in bail fees and legal fees, days or weeks of your life taken, all because a cop got a hardon.